With only two weeks left until Christmas time is running out to buy presents so I've got some more ideas for you if you're struggling for inspiration. Perfume is always a lovely gift to give and my favourite fragrance right now is the gorgeous Fantasy Intimate Edition by Britney Spears, aside from the fact that it smells amazing the bottle is absolutely stunning and would look beautiful on anyone's dressing table plus it's currently on offer in Boots so go and grab yourself a bargain. Another great gift to give are candles and there's no better than Yankee Candle, their new 2015 Christmas range smell so good, Cosy by the Fire and Winter Glow are my favourites. They come in a range of sizes and prices so there's something for everyone and would make a great gift or stocking filler. If you're anything like me then you'll love a good mug, I have so many I'm running out of space in my cupboard but I still keep buying them and I think they make great gifts because mugs are something we all use. Starbucks have a lovely range of Christmas mugs, my favourite is the Candy Cane mug and I think they would make a fab gift for women or men of all ages. I love anything to do with home decor and I really like receiving homeware gifts because quite often people get me items that I wouldn't normally have bought myself but end up being some of my favourite items. Flamingogifts.co.uk have lots of gorgeous homeware gifts as well as fashion items and gifts for children. 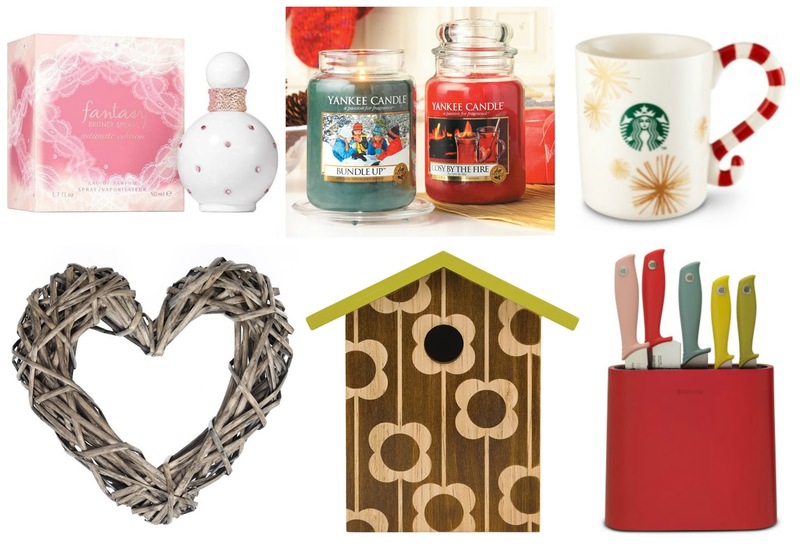 I love the Wicker Heart as it would fit in well in most people's homes and I adore the Orla Kiely Bird House because it's so pretty and makes a really unusual gift idea. My last gift idea is perfect for a friend or relative who loves to cook, we cook a lot in our house and the one thing we never have enough of are good quality knives, this knife block and knives from Brabantia would make a really useful gift for someone and it won't break the bank. The thing I love the most about this particular knife block is that instead of having different sized slits for each knife to fit into it has lots of movable rods which adjust to accommodate any cutlery size and shape so you can put any knives you like in there, how cool is that? Hopefully this gives you some last minute gift ideas, now get out there and finish your Christmas shopping!